Mario Campisano’s story in his own words. Most of you have heard about the “22 a day”, and for those of you who have not, 22 soldiers a day take their lives due to PTSD. It saddens me that this goes on and I really struggle every time I hear that another one of our heroes took their own life. There are so many who are suffering from this on a daily basis. I’m a member of the post 304 in Acworth Georgia, and one of the things our Post sponsors is a PTSD fund-raiser to train service dogs for our service members who suffer from PTSD. 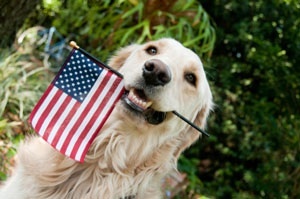 This has been very successful, allowing us to provide service dogs to veterans. These service dogs provide hope and the ability for the soldiers to lead a normal life. As most of you know, in the past couple years I’ve taken up running for two reasons, to live a healthier lifestyle and because I decided I wanted to coach my daughter’s running programs here in my town. I know it’s not for everyone but I really have had some fun times running the races with her. 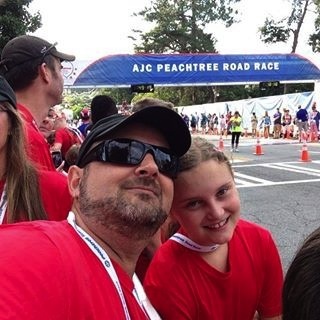 I’ve enjoyed it so much that I started to taking it a little more serious, so serious enough that I registered for the Peachtree Road race which was held on the Fourth of July this year. I have run many 5K’s, but never a 10K, so, this was my first. I was thinking about how I could make this a special race for me, besides just finishing it in under an hour, which I could achieve, as long as I did fall flat on my face during the race. I thought about it long and hard, and decided, why don’t I help our brothers and sisters, who have defended our country. So what did this have to do with the Peachtree Road Race you ask? I had planned on raising $100 for each mile I run, so in the end, raising $600. Well, this far exceeded my expectations and the $600, soon rose to $2000, then to $3000, and so on, until finally, I decided to try to fund one dog, which is $6000. We have come a long way in the short two month time frame, raising $4750 of the $6000. It could never have happened with the support of so many who have shared the campaign, donated, and just worked real hard to raise the awareness to this cause. I could not be any happier at how far we have come. I will be continuing this effort until August 18, then I will present a check to the Post 304, during our monthly meeting. I’m asking for everyone to continue to share this with all your friends and let them know what I’m doing. I really appreciate all the support and all the comments I’ve gotten from all of you regarding the running and the training and hope that you take the time to donate. Please make the checks out to, “American Legion Post 304” and mail to Mario Campisano at PO Box 2133 Kennesaw, GA 30156 . Or visit the American Legion GoFundMe page at http://www.gofundme.com/suzx6eg to make a contribution. Every little bit helps.